Bock’s heavy (Kings German Legion) cavalry brigade and Anson’s British light cavalry brigade were in hot pursuit of the French army on the 23rd, the day after Wellington’s smashing victory at Salamanca. Marshal Marmont detailed Foy’s French division along with Curto’s French cavalry brigade to act as the rearguard and cover the French retreat. 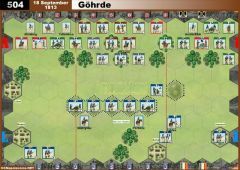 As the Anglo-German cavalry force approached, Curto’s cavalry retreated instead of advancing to engage, leaving Foy’s infantry alone to face the cavalry. Foy quickly ordered his rear-most units to form square, but the first square charged held their fire too long. Their volley hit home, but the momentum of the charge propelled mortally wounded horses and riders into the square. 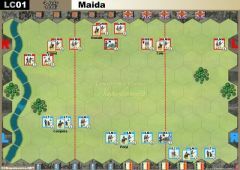 The shaken infantry did not close ranks and surviving troopers burst into the square through the gaps. The square dissolved in panic - a rare event in the Napoleonic Wars. Normally a steady square could withstand the best cavalry, but the extraordinary event of horse and rider smashing into the square led to the square’s demise this time. 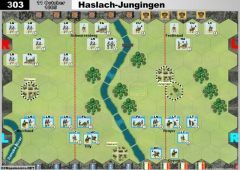 The heavy cavalry, joined by Anson’s light cavalry, continued their pursuit and attacked a second square. 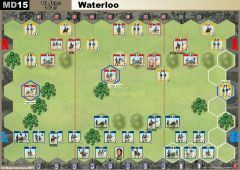 The second square was so demoralized by the destruction of the first square that its troops also broke and ran before the cavalry. 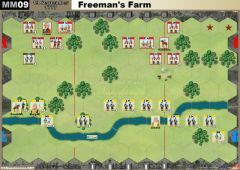 Foy, seeing that the field could not be held, retired with the rest of his troops. His division had fought magnificently the day before at Salamanca, allowing the French army to escape, but Garcia Hernandez was one rear guard action too many for these fatigued troops. 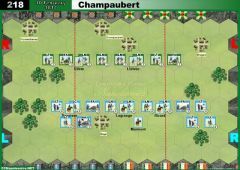 The first French infantry unit eliminated will count as one Victory Banner for the British player and each infantry unit eliminated after the first will count as two Eagles. French win 6-0 with a cavalry charge whilst infantry stayed out of trouble (helped by fight-first TC and a double retreat). A Tactician Card an easy sacrifice to position leader so that cavalry could be brought into action. 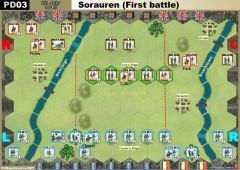 British should not waste time attacking the squares at first, just keep them in square, put other infantry in square if possible and counter the French cavalry. French give up on the 2 infantry units in square - win is made possible if you can hunker the rest down in and around the woods, whilst the cavalry ride back to the rescue. British cavalry need to try pin down a couple more infantry, and pick a couple more off if possible before the French eliminate too many of them. A close scenario based on the 3 plays I’ve had. Played this scenario twice tonight. Went 6-1 British then 6-5 French. 2 totally different games with each player playing the same side twice. Shows what a difference cards and dice can make to the same set up. 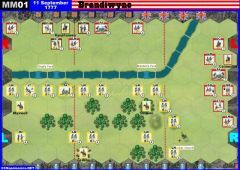 British quickly whittled away both French squares in the first playing taking a few losses then got aggressive with their LC and took on the French cavalry. After an even exchange of blocks the Brit played Rally and got 4 horses in the roll. 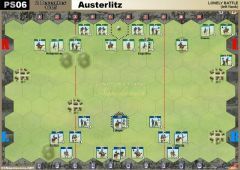 The lucky roll which rebuilt 2 depleted Brit LC then allowed them to continue the charge and take out the 2 French LC. (5-1). the French never got back into the game. The second playing had the French all aggressive at the start and they took the first honors after rifle and artillery fire eliminated a Brit HC. 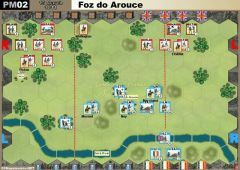 After finding the French squares hard to whittle away the British cav went for easier targets and soon had 4 French LI in square and Foy plus the artillery out of the battle (2-2). Further aggression by the French HC had the British LC reeling and despite taking out a French LI it was soon the British on the back foot looking desperately for quick kills to try to get back into the game (5-3). despite getting a second French LI (5-5) the British lost it when the French HC charged home and routed a 4th Brit LC with 3 swords in 1 roll to win a tighter and more exciting 2nd playing. Double French victories. It could have been with a flawed strategy, though. 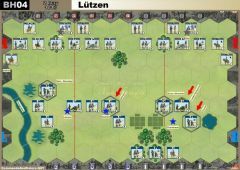 Overload the French command structure by forcing them into square and maintaining a threat. Then, look for infantry in line and pick them off. 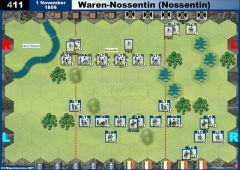 The trouble with this is that the central woods and the French cavalry make it tougher for the British cavalry to maneuver as easily as they could. I'm going to revisit this one since there are recorded British victories noted here. Just got beaten by British player 7-0. No luck in cards and dice for French. Double win for French in two different battles ending 6-5 both times. Interesting and fast scenario for half an hour (top).